There was a real race to the finish on the 120km ride. Two Young Riders racing off. Not unusual from what I've seen in Namibia and South Africa. These folks call it a race. They don't always try to win, but the one who wins is celebrated by all, and those that try to win, really try to win. Both the 120km and 160km events in Namibia - Walvis Bay - were likewise highly contested - race to the finish. There are several siginificant differences. One - both Namibia and South Africa have a qualification system in place. 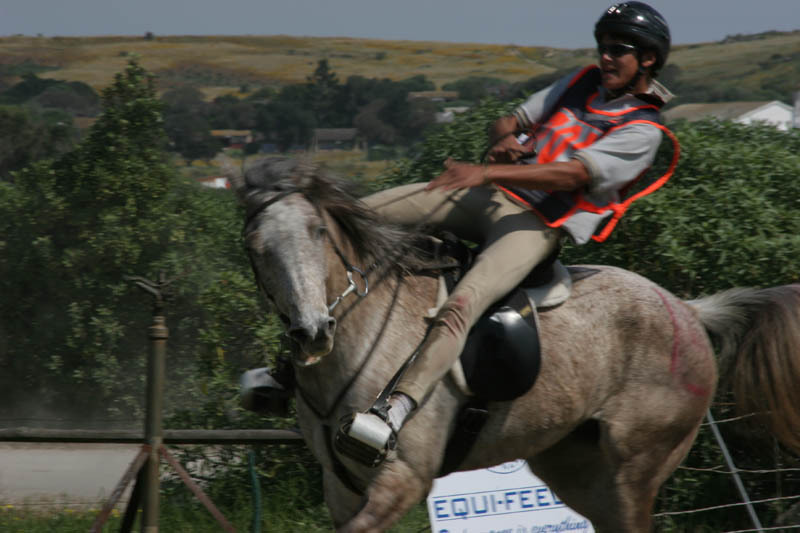 I think Namibia has stricter qualifications than SA, but basically the horses have to do x number of 60km rides (in Namibia it's 3) and then x number of 80km rides before they can move up to either 120km or 160km rides. Since there aren't that many rides in southern Africa, and folks have to travel fair distances to attend rides, this typically takes 2 seasons. So horses that are entered in 120km or 160km rides usually have a base of 2 years on them. Two - the rides often have a cut off time. For the 160km, the cutoff was 14 hours ride time. The 80km also had a cutoff - maximum ride time was 8 hours. (Trilby would have to hurry a little over here). They do not polk along like we often do in the USA. Rojan and I rode the 80km ride, this was his horse's first 80km ride and he was 'taking it easy'. Our ride time was 6:45 - maximum would have been 8:00. Still a pretty good clip. I think the winning time was around 4:30 on a fairly flat and easy course. Three - the National club keeps log books for every horse (at least this was the case in SA - I think it's the same in Namibia). Every ride is recorded, including eliminations for lameness or metabolics. The books also contain vaccination records similar to FEI passports, and horses must be keep current on their vaccinations, just like FEI. (the rider is issued a 'warning' if the vaccinations are out of date, or ID diagram incorrect). Four - they still run some National rides with an Open Gate system. (though Namibia has almost gone entirely to FEI rules - same as AERC basically). This is more common in South Africa, but some think this will eventually change too. They come into the vetgate - and after they cross the line the horses have 25 minutes to recover. They don't even present to the vet until 25 minutes after they come in. At 25 minutes, they present, (if not recovered they are eliminated) - and then they have another 25 minutes of hold before leaving. One - like the USA - they have weight division categories in addition to overall placement - light, standard, heavy. Plus Junior/Senior category. They are also very big on Team competitions - typically the clubs from the different regions field a team. Two - except for the remnants of the Open Gate system in SA, they run the same rules, basically the same as FEI. They also do drug testing. They also have year end awards - sometimes based upon points and rides ridden, as well as judged awards 'most improved', etc. And finally - they are friendly and supportive and will do anything to help each other out. This is the same the world over I think. It is very much a family sport here, plus a smattering of hired men doing the actual competing (e.g. Franz at Walvis Bay, and Willa at Saldanha). Men or boys who ride for the owners, for the farmers.